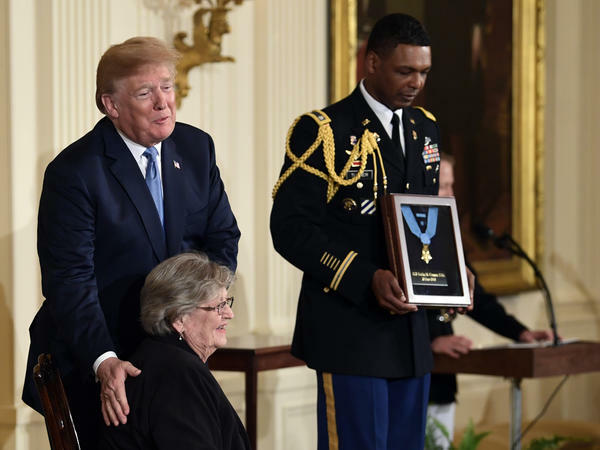 President Donald Trump with Pauline Conner, widow of 1st Lt. Garlin Conner, during a ceremony at the White House Tuesday. Trump presented the Medal of Honor posthumously to Conner for his actions in January 1945 during World War II. Pauline was not quite 16 when she first saw Conner as a returning veteran making a speech outside the Clinton County courthouse in Kentucky near where they were both raised. "I am not a speaker and did not come out here to make a speech," she said he began, "but will try to explain to you a small part of the war in Europe and some of the things I saw." But he never told them what he did, just where he went. Conner stood just five foot six and weighed no more than 120 pounds. Pauline stood in the crowd with her mother, and couldn't believe this man was the hero everyone talked about. "I said to Mother, 'My God, that little wharf rat, he couldn't have done all they said he'd done,'" she recalled, laughing. "Because he was sitting there so small." Still, the quiet veteran and the teenager hit it off. After a week-long courtship, they were married. Conner stuffed his medals into a box that stayed in his duffel bag in a living room closet. And he returned to farming a 36-acre parcel on Indian Creek, raising cattle and growing corn, wheat and tobacco. Besides his nightmares, all that was visible about Conner's time in combat were his wounds. He was shot in the jaw and lost a tooth. Another shot pierced his leg, and doctors had to replace part of his hip bone with steel. "He was shot through the thigh on one of his wounds," said Pauline, "and it came out his hip joint - a hole in his hip like that." It was five decades later that an army officer whose uncle was with Conner's unit began to push for Conner's Distinguished Service Cross to be upgraded to the highest award, the Medal of Honor. That took two decades more. And it was sealed with the eyewitness accounts of Conner's three fellow soldiers found in the National Archives. They were all with the 3rd Battalion, 7th Infantry Regiment of the 3rd Infantry Division, pushing in an area of Eastern France known as the Colmar Pocket, trying to push out the enemy troops and gain a foothold on the Rhine River. Conner was recovering from wounds at a field hospital, just before his heroic actions. "He snuck out of the hospital and made his way back to his unit," President Trump said at the White House ceremony. Accounts by the three soldiers told how Conner ran forward with telephone wire so he could talk with the artillery unit several miles behind him. Dr. Erik Villard, a historian with the Army Center for Military History, picks up the story. "He was out in front of the American lines," said Villard. "And the German infantry at one point, you know, got within 10 meters of his position. In the last stage of the assault, he basically called artillery on himself and said, 'Just keep firing for effect.'" Villard said Conner faced German tanks and hundreds of infantry, and likely thought he wouldn't make it out of that ditch, but at least he could help his comrades. Conner spent his later years volunteering, helping disabled veterans get their pension benefits. He died in 1998 at age 79. It was only recently Pauline started getting calls from Washington. The president would soon be calling, she was told, about the Medal of Honor. She was skeptical. "And I still thought it could possibly be a scam because I'm 89 years old, and people like to prey on old people like me," she said. She quickly learned it was all true. And today she was at the White House, receiving a medal for the man she calls, "my hero." Tomorrow, President Trump will present the Medal of Honor posthumously to First Lieutenant Garlin Conner. In January of 1945, Conner dashed ahead of the American lines and slipped into a drainage ditch to call in artillery strikes on advancing German forces as they were surging toward him. His actions in the Second World War prevented his battalion from being overrun. NPR's Tom Bowman has his story. TOM BOWMAN, BYLINE: Conner never spoke to his wife about his actions outside Houssen, France, that day or any of the other battles he witnessed in North Africa, then Sicily, through Italy and France and finally into Germany. He was wounded seven times. PAULINE CONNER: Many of the time he'd wake up in the night with nightmares. And after, I would wake him up, and he would go outside, sit on the porch and smoke cigarettes for hours at a time. BOWMAN: Pauline was almost 16 when she first saw him as a returning veteran making a speech outside the Clinton County courthouse in Kentucky near where they were both raised. He stood just five foot six and weighed no more than 120 pounds. Pauline couldn't believe this man was the hero everyone talked about. CONNER: I said to Mother, my God, that little wharf rat, he couldn't have done all they said he'd done (laughter) because he was sitting there so small (laughter). BOWMAN: But the quiet veteran and the teenager hit it off. After a week-long courtship, they were married. He stuffed his medals into a box that stayed in his duffel bag in a living room closet. And he returned to farming a 36-acre parcel on Indian Creek, raising cattle and growing corn, wheat and tobacco. Besides his nightmares, all that was visible about Conner's time in combat were his wounds. He was shot in the jaw and lost a tooth. Another shot pierced his leg, and doctors had to replace part of his hip bone with steel. CONNER: He was shot through the thigh on one of his wounds, and it came out his hip joint - a hole in his hip like that. 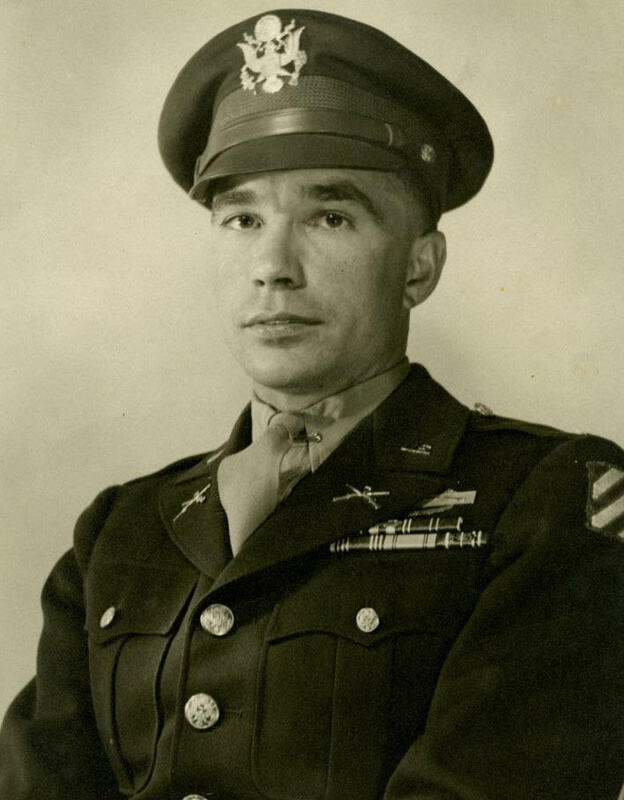 BOWMAN: It was five decades later that an army officer whose uncle was with Conner's unit began to push for Conner's Distinguished Service Cross to be upgraded to the highest award, the Medal of Honor. That took two decades more. And it was sealed with the eyewitness accounts of Conner's three fellow soldiers found in the National Archives. They told how Conner ran forward with telephone wire so he could talk with the artillery unit several miles behind him. Dr. Erik Villard, a historian with the Army Center for Military History, picks up the story. ERIK VILLARD: He was out in front of the American lines. And the German infantry at one point, you know, got within ten meters of his position. In the last stage of the assault, he basically called artillery on himself and said, just keep firing for effect. BOWMAN: Villard said Conner likely thought he wouldn't make it out of that ditch, but at least he could help his comrades. Conner spent his later years volunteering, helping disabled veterans get their pension benefits. He died in 1998 at age 79. It was only recently Pauline started getting calls from Washington. The president would soon be calling, she was told, about the Medal of Honor. She was skeptical. CONNER: And I still thought it could possibly be a scam because I'm 89 years old, and people like to prey on old people like me. BOWMAN: She quickly learned it was all true. And tomorrow, she'll appear at the White House to receive the medal for a man she calls my hero. CONNER: Something he should have done in his lifetime. But I'm going to be proud to accept it. BOWMAN: Tom Bowman, NPR News, Washington. Transcript provided by NPR, Copyright NPR.